Isaac Asimov is best remembered nowadays for his books about robots and future galactic empires. But among his science-fiction tales are some cracking good mysteries, crime stories set against a background of future time and place. The Caves of Steel (1954) is one of the best. It contains the basic ingredients of a classic whodunit: an honest investigator faced with confusing clues and a variety of suspects. The sleuth is Lije Baley, a likable plainclothes detective. He comes complete with a nagging wife, a demanding boss, and an over-bright sidekick whom he admires but doesn’t fully trust. He faces personal danger as he struggles to investigate brutal murders which could spark off a serious international incident. The place is New York City. The year is AD 3421. “The caves of steel” sums up Asimov’s picture of a future Manhattan, whose inhabitants live and work in a vast underground warren. They’ve become so used to this, that they are afraid to venture into the open air, and mostly they don’t have to; food is produced in subterranean farms (it’s rationed, but nobody starves), and energy comes from nuclear power plants. Water, air, transport, leisure--all are provided underground, using high-tech solutions which, as always with this author, may read like fantasy, but are grounded in real science. Yet the people and their motives--love, hate, loyalty, jealousy, idealism, fear--haven’t changed anything like as fast as their surroundings. Asimov paints the background with as much care and detail as any historical writer describing the Tudors or the Romans. A good science-fiction story has a lot in common with a good historical one: they both draw us into an alien era, but one is looking to future time, the other to the past. Lije Baley is pretty content with his lot; he has a family he loves and a job he likes, and the more promotion he earns, the better lifestyle he will have. His fellow New Yorkers, too, accept their somewhat ant-like existence. Mostly. A few, the Medievalists (what a beautifully anachronistic name! ), are nostalgic for bygone days, when humans lived in cities open to the sky, and, they are sure, life was much better. And nearly everyone is hostile to the Spacers, who have a base near the city. When an important Spacer scientist is killed there, Lije Baley is ordered to investigate, because it’s assumed the murderer must have come from within the city. These Spacers are humans whose ancestors emigrated from Earth generations back, to colonize other planets in the galaxy. By doing this they’ve become richer, freer, and longer-lived, and they despise the stay-at-home city dwellers, who in return loathe their arrogant superiority. The Spacers have to keep Earth-dwellers at a distance, for fear of disease, so if they need to visit New York they stay sealed in their own base nearby, guarded by fearsome security and quarantine barriers. Well, you get the picture: the two sorts of humans rarely mix, and hate one another. Lije is torn between a desire for justice and a gut feeling that the dead Spacer probably had it coming. His sense of justice wins, even after he learns that the Spacer authorities have insisted on assigning one of their own men to work with him on the case. And even when he realizes that this new partner isn’t a man, it’s a robot. Yes, a robot--well, this is an Asimov story after all. Lije and his fellow citizens hate Earth robots, which are primitive as robots go, but are still good for the simpler tasks, and as a result are gradually taking over people’s jobs. The New York police department has even hired a messenger-robot, Sammy, which has displaced a keen young trainee. But Lije’s new partner, R. (for “Robot”) Daneel Olivaw, is designed by Spacers, and is therefore a far more advanced model. He looks and behaves just like a human detective, so he can live and work in the city without arousing public anger. He has some useful add-on powers--a faultless memory, and great physical agility which saves Baley’s life at one point in this book. He has no emotions, of course, and this makes him an unnerving partner, but he’s also no threat to Lije or his fellow New Yorkers, because special circuits in his brain prevent his ever harming a human being. Or do they? As Lije and Daneel comb the city looking for evidence and suspects, the policeman begins to feel a grudging respect for the robot. But his wife is horrified when she discovers Daneel’s true nature. How, though, did she find out? Lije had carefully not told anyone, and Daneel makes a convincing human cop. Somehow the Medievalists have got to know there is a robot at large. Is Lije’s wife a sympathizer? And is he in danger as a result? There is indeed danger, including another murder, and Lije starts wondering just how reliable Daneel really is. Could he be a killer? Or could the murderer be another Spacer, trying to stop his colleague’s researches? Perhaps the backward-looking Medievalists are responsible, or even the youngster who lost his job to Robot Sammy. Eventually the partners solve their case, and there are even hints of a way to end the conflict between city people and Spacers. It’s a satisfying conclusion. I first read this book in the 1950s. Re-reading it now, I’m pleased to find I enjoyed it just as much, though not necessarily for the same reasons. The mystery is still good, and the depiction of a future New York, convincing in the ’50s, is in many ways still compelling, though inevitably it feels a bit dated, because some of the ideas have been overtaken by more recent events. The police procedure, for instance: Lije and Daneel have access to huge databases of information all citizens, and there’s some very fancy brain analysis and psychological profiling, but of course there’s no DNA analysis, no mobile phones, no Internet. To me, it doesn’t matter; far from it. It gives an added dimension to the story. 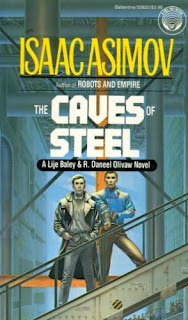 Undoubtedly, Asimov would have portrayed his caves of steel differently if he were writing about them today. Where exactly his vivid imagination would have taken him is an interesting speculation. And a mystery of an altogether different kind. Just wanted you to know that I nominated you for one of my favorite blogs over on my blog. Woo! Have a great weekend and keep up the good work. I love your blog.